As noted in Part 1 of this two-part Economic Synopses essay, the Taylor rule is widely used in academic research on monetary policy rules.1 This rule, and its many variants, is also followed widely among financial market participants, economists, and those in monetary policymaking circles. In a recent speech, Federal Reserve Bank of St. Louis President James Bullard presented an alternative version of the Taylor rule that reflects three developments that today's monetary policymakers routinely confront. First, the economy has entered an economic regime of low interest rates that reflects, importantly, weak productivity growth and a strong demand for safe assets.2 Second, the Fed appears to have successfully engineered a regime of low and relatively stable inflation expectations that are anchored near the Fed's inflation target. Third, the Phillips relationship that posits a negative relationship between inflation and the current level of the unemployment rate and a measure of the "natural rate" has all but disappeared.3 Accordingly, this development means falling levels of the unemployment rate relative to its natural rate will have a very small effect on inflation. it = ρit–1 + (1 – ρ)(rt* + π* + ϕππtGAP + ϕuutGAP). Bullard's modernized version of the Taylor rule embeds several changes from Taylor's original specification.4 First, there is a one-quarter lag of the federal funds target rate (it–1) with a fixed coefficient of ρ. This "smoothing" parameter is used by many in the policy rule literature. In this case, Bullard assigns ρ a value of 0.85. This assignment means that the past period's policy rate is extraordinarily important for setting the current period's policy rate. Second, the output and inflation gaps remain in the policy function, but they are measured a bit differently. The output gap (utGAP) is instead measured as the difference between the current unemployment rate and the Congressional Budget Office's natural rate of unemployment. The inflation gap (πtGAP) is measured as the difference between a market-based measure of inflation expectations and the Fed's inflation target. Specifically, inflation expectations are measured as the difference between the nominal yield on a 5-year (5Y) Treasury security and the yield on an inflation-adjusted (real) 5Y Treasury inflation-protected security (TIPS).5 This difference is sometimes called the breakeven inflation (BEI) rate. Third, rt* now varies over time instead of being set at a fixed 2 percent. In this case, rt* is measured as the trend interest rate estimated from a Hodrick-Prescott filter of the 1-year nominal constant maturity Treasury yield less the four-quarter change in the Federal Reserve Bank of Dallas's trimmed mean measure of the personal consumption expenditures (PCE) inflation rate. Fourth, the current inflation rate, πt, is replaced by the Federal Open Market Committee's (FOMC's) inflation target (π*), which is set at 2 percent. Finally, Bullard reduces the coefficient on the unemployment rate gap (ϕu) to 0.1, to reflect the flatness of the Phillips curve. The coefficient on the inflation gap (ϕπ) is equal to 1.5 and consistent with the 1993 Taylor rule. Since ρ equals 0.85, this value means that the rule is very inertial in setting policy—that is, the past period's federal funds target rate is important for setting the current period's target rate. The figure also plots the federal funds rate calculated from the 1993 Taylor rule, as described above and plotted in Part 1 of this Economic Synopses essay. To see how these two rules differ in their policy prescriptions, consider the prescription for the fourth quarter of 2015, when the FOMC lifted its federal funds target rate for the first time in a decade. The 1993 Taylor rule indicated that the rate should be set at 0.88 percent. The average of the five rules cited above was 0.12 percent, which was pretty close to the actual average of 0.16 percent. Over the next four quarters, real GDP growth remained close to 2 percent, the unemployment rate fell from 5 percent to 4.7 percent, and inflation increased from 1.6 percent to 2 percent. In the fourth quarter of 2016, the 1993 Taylor rule indicated that the target rate should be 2.9 percent, while the average of the five modernized Taylor rules was 0.46 percent. The actual target rate in the fourth quarter of 2016 was 0.42 percent. A key difference between the two rules during this period is that the 1993 Taylor rule assumes a fixed r* equal to 2 percent. In the modernized rule, rt* was equal to –1.12 percent in the fourth quarter of 2015 and then –0.72 percent four quarters later. 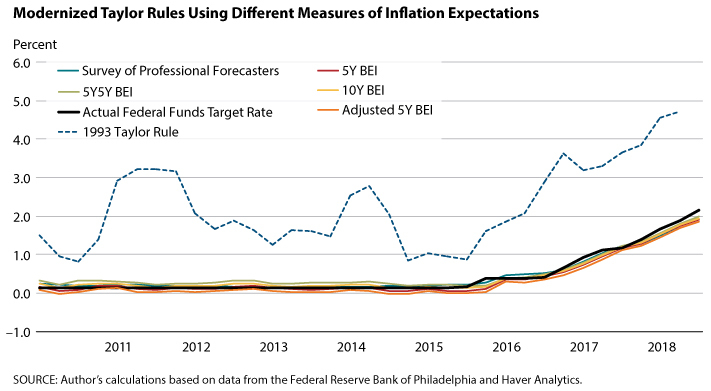 If inflation expectations remain anchored at close to 2 percent and the unemployment rate remains close to its current level or even falls a bit further, then the rule stipulates that the only reason to raise rates would be if rt* increases. 5 The Treasury uses the consumer price index to adjust the nominal price of the TIPS. Bullard subtracts 30 basis points from the 5Y BEI, arguing this better accounts for the upward bias of the consumer price index relative to inflation measured by the PCE inflation rate. 6 The inflation expectations measure is the median response. 7 The rules in the figure for the fourth quarter of 2018 use the average of daily observations for inflation expectations and the federal funds target rate. The latter includes the 25-basis-point increase in the federal funds target range on December 19, 2018. Bullard, James. "The St. Louis Fed's New Characterization of the Outlook for the U.S. Economy." Federal Reserve Bank of St. Louis, June 17, 2017; https://www.stlouisfed.org/~/media/files/pdfs/bullard/papers/regime-switching-forecasts-17june2016.pdf?la=en. Bullard, James. "Modernizing Monetary Policy Rules." Presentation to the Economic Club of Memphis, Memphis, TN, October 18, 2018; https://www.stlouisfed.org/~/media/files/pdfs/bullard/remarks/2018/bullard_memphis_economic_club_18_october_2018.pdf?la=en. Powell, Jerome H. "Monetary Policy and Risk Management at a Time of Low Inflation and Low Unemployment." Remarks to the 60th Annual NABE Meeting, Boston, MA, October 2, 2018; https://www.federalreserve.gov/newsevents/speech/powell20181002a.htm.